Over the decades, cars have become safer thanks to advances in technology including airbags, ABS (anti-lock braking system) and even things such as PCSS (pre-collision safety system) which may not stop an accident from occurring but can assist in decreasing impact and damage. That said, technology can only do so much whilst humans remain in control of motor vehicles. Whilst we do have insurance to give us some peace of mind should accident ever occur one of the worst situations to end up in is where it is your word against another party. This ends up bogging down a claim and ultimately getting you back on the road. This is why it can be beneficial to have video evidence to help remove all doubt in such circumstances and aid in a speedy resolution. Anyway, I was fortunate that the folks over at MobileZap offered to let me try out a dashboard camera to see how it would fare. They’ve got stack of other products and accessories as well if you fancy checking them out. quality of the camera optics (particularly in low light). As you may imagine, not all dashcams are created equal so here’s a small montage of video captured on my unit which seems to be similar to the DVR-207 mentioned over on DashCamTalk. This unit was about $50 not including the cost of the SD card and as you can see in daylight the picture quality is average. Reading text in the video whilst the picture itself was stationery is possible but as distance increases the legibility decreases. Text legibility during motion was also impacted despite the recording at HD resolutions (720p). This may or may not be of concern if an insurance claim hinges on being able to clearly identify the registration number or physical characteristics of another vehicle. Recording at night is another consideration. The unit I received includes a built-in array of infrared LEDs to illuminate the view in front of the camera. On paper, it sounds like a neat feature but in reality it’s only effective for enclosed areas one or two metres ahead of the camera. For example, if you’re driving down the Hume Highway in the middle of the night, the LEDs will have very few objects for the infrared light to reflect off to show up on the camera unless a kangaroo jumps out in front of the car. Nonetheless, the camera does manage to capture video in low light but the quality was highly dependent upon overhead illumination provided by street lighting plus headlights. Audio quality may also be an important feature. 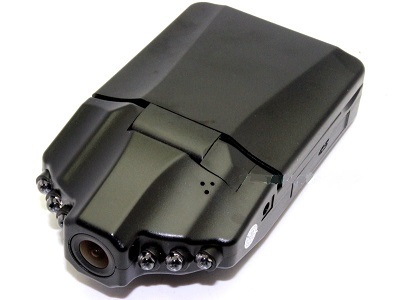 Most dashcams include built in microphones but, like cameras, not all are created equal. The microphone in the DVR-207 was average but not fantastic. Whilst the car was stationery, you can understand a conversation inside the car and lyrics to music. However, whilst the car is in motion a good amount of noise (which sounded like tyre roar in my experience) is picked up which can overwhelm other useful audio like the clicking of the indicator or horns sounding from other vehicles. GPS is another option that may come in handy particularly if you need to keep a vehicle log book or to confirm the location of an accident. The unit I had didn’t include GPS but would be a feature I’d consider later on. Admittedly, you can drop quite a bit of cash on a dashcam these days (hundreds of dollars) depending upon the features and capabilities you’re after and whether not any dashcam is better than no dashcam at all. If you drive mainly during the day then a $50 dashcam may fit the bill. Otherwise, if you drive evenly between day/night or mainly night driving then investing in a dashcam that can deliver the required picture quality under those conditions. Personally, I would arm my vehicle with a cheap dashcam in the short term whilst I investigated the broad selection of dashcams. You never expect to have an accident (or witness one involving other parties) but when you do you may find yourself resorting to the old “coulda, woulda, shoulda”. It’s a small price to pay upfront to obtain an automatic record of events that can expedite future insurance claims and minimise angst.